There’s the printer you want and the printer you can afford. Where do your budget and your needs meet? To help you decide, we’ve selected the best models at or around four major price thresholds: $150, $300, $500, and $750. A $150 printer is in most shoppers’ reach, and is almost always an inkjet unit that’s designed for low-volume use in home offices, homes, or dorm rooms. At about $300, you get a choice of faster, more capable inkjets, and a few very basic laser or LED models. Many color laser and LED products come into view at the $500 price point, and at $750 or more, you can begin to enjoy the speed, features, and cheaper consumables of serious office printers. The best printer has the capacity, features, and speed to match what you actually print on a regular basis. Take a few minutes to think hard about what types of things you print—whether it’s documents, photos, or something in between—to make sure you get a printer that can produce satisfactory output quality in all areas. Also think about how much you print, to make sure you get enough paper capacity; and how many people need to use the machine, in case you require wired or wireless networking capabilities. Check the chart to the left for a quick profile of the kind of printer you can get with the money you have. Though multifunction printers appear to be the wave of the printing future, they have some limitations. If your office is very busy, forcing a single machine to juggle everyone’s printing, copying, scanning, and faxing demands could overwhelm it—and frustrate your users. Another considera­tion to keep in mind: If you have a long-term need to scan hundreds or even thousands of pages of documents, a dedicated document scanner that has its own automatic document feeder will simplify that job considerably. If your budget is really tight, check out our favorite bargain, the $100 Canon Pixma iP4920 Inkjet Photo Printer, in “Cheap and Good,” below. It makes surprisingly few compromises for the price. Whatever your budget, some standout features can differentiate one model from another that’s similarly priced. At the top of the list is automatic duplexing, which cuts your paper costs (and tree killing) in half. You should also look for a wireless networking capability—this is fast becoming essential in office and home environments. Check for apps or services for sending print jobs directly via Wi-Fi or email, as well. Among multifunction models, an automatic document feeder (ADF) makes scanning of longer documents much easier. Some models also can print labels on CDs and DVDs. Finally, check the prices and page yields of the printer’s ink or toner cartridges, making sure that they match your usage pattern—as well as your budget for ongoing costs. Now that we’ve summarized what you should look for, consider our recommendations for each price category. The sweet spot for consumer inkjets is about $150. You’ll find a crowded field of models, most of them offering at least decent features and performance for home and home-office users, plus students. If this is your budget range, keep in mind that these machines are de­­signed for fairly low-volume use: around 15 to 20 pages per day, at most. Monochrome lasers are also available, but we can’t wholeheartedly recommend any such models in this price range, as their toner costs tend to be very high. Our top pick is a multifunction inkjet, the HP Photosmart 7510 e-All-in-One Printer. Though it’s billed as a photo-oriented home ma­­chine, it can handle far more than that. Most notably, it posted average or better speeds in our printing, scanning, and copying tests; and it includes an ADF, a feature that’s rare at this price level. Among other standard equipment are a 125-sheet input tray and a 20-sheet photo tray (for media up to 5 by 7 inches in size); and the unit’s automatic duplexing applies to both the printer and the scanner. The cherry on this sundae? HP’s ink costs are reasonable, meaning no regrets later. If you can do without an ADF, check out the Canon Pixma MG5320 Wireless Inkjet Photo All-In-One Printer, a multifunction unit that features printing on CDs and DVDs, and that has speedy performance and good print quality. Also, the MG5320’s ink-refill costs are reasonable. As for single-function printers, the Epson WorkForce 60 inkjet offers USB, ethernet, and Wi-Fi connectivity, good paper handling including automatic duplexing, and outstanding speed. Its ink costs are at or below average. If your budget can stretch a bit more, here’s a $200 model worth considering: The Canon Pixma MG6220 Wireless Inkjet Photo All-In-One has cool-looking controls and a color LCD embedded in the scanner lid. (Unfortunately, that means no ADF.) The MG6220 serves up high-quality printouts and decent scans, and it’s fast for an inkjet MFP. Its ink costs are on the high side of average. If you have just $100 to spend, the simple, capable Canon Pixma iP4920 Inkjet Photo Printer is our top choice. It has only USB connectivity (no ethernet or Wi-Fi), but its paper handling—two 150-sheet input trays, with automatic duplexing—is tops for its class. Its speed is brisk, printing plain text pages at 8.9 pages per minute and photos at average to fast speeds. 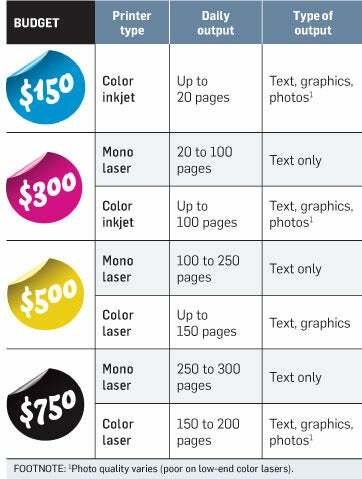 Print quality is nice, and best of all, ink costs are reasonable: 4.7 cents per page for black and 2.6 to 2.9 cents per page for each color. As a bonus, this model can print labels on specially coated CDs and DVDs. The $300 range offers an interesting either/or choice: high-end color inkjets with full feature sets, for small-office or high-end home use; and very-low-end lasers for small or home offices. But note that while you can get a pretty nice monochrome laser for $300, a like-priced color model will be slow, lacking in features, and expensive to replenish. Our top pick within this price range is the $300 HP Officejet Pro 8600 Plus e-All-in-One Printer, a state-of-the-art inkjet MFP in nearly every respect. Best of all, its ink costs are among the lowest we’ve encountered. The Officejet Pro 8600 Plus has both speed and features. It posted a record-setting speed of 13.2 pages per minute printing plain text, and was pretty fast at printing photos, copying, and scanning, too. Its many features in­­clude universal automatic duplexing—for copying and scanning, plus printing—and full support of legal-size paper, both on the flatbed scanner and in the 50-sheet ADF. However, it can’t print on a CD or DVD, and its context-sensitive touch controls seem slow to react. This high-end model is also ready to print from your smartphone or tablet, or from a remote location. HP’s free ePrint service lets you email print jobs to the Officejet Pro 8600 Plus or any other ePrint-enabled HP printer. Aimed at the home user who wants pretty much everything is the $300 Epson Artisan 837 Color Inkjet All-In-One. This unit, clad in a distinctive midnight blue, provides CD and DVD printing, plus an ADF. Speed is above-average for mainstream documents, and fast for photos. The six-ink printing system helps produce stunning photos (if somewhat soft, slightly gray text), and the replacement costs are low. Epson is also catching up with our increasingly smartphone- and tablet-riddled world, offering Email Print for sending email from a mobile device to an enabled Epson printer, and iPrint for direct printing via Wi-Fi to compatible iOS and Android devices. Looking for a nice, simple monochrome laser? The $300 Dell 2350dn Laser Printer offers small and medium-size workgroups peppy performance, impressive print quality, and reasonable, midrange toner costs. It has automatic duplexing, and you can augment its standard 250-sheet input tray and 150-sheet top output tray with a second, 550-sheet input tray for $100. It printed plain text pages at a swift 22.8 pages per minute. If you have $500 to spend, you’ll find many low-end color laser models in reach, geared toward small offices or workgroups. But these models all have some imperfection: slow performance, expensive toner, or a feature that falls short. To get more, you’ll have to pay more. Our top pick is a single-function color laser printer, the $500 Brother HL-4570CDW. With a low price for this printer category, it has a generous feature set. Connectivity includes USB, ethernet, and Wi-Fi. It has three standard paper trays: a 250-sheet main input for letter and legal-size paper, a 50-sheet multipurpose feeder for envelopes and thicker or odd-size media, and a 150-sheet top output bin. You get automatic duplexing, too. Performance is also competent. The HL-4570CDW printed plain text pages at an above-average rate of 16 pages per minute. Even on photos it managed a competitive speed of 3.2 ppm. As with many lower-cost color lasers, photo quality is an issue. Color graphics and photos on plain paper looked slightly dull and exhibited distracting moiré (background patterning). Changing to higher-quality settings and using glossy laser paper helps somewhat. Among multifunction units, the $549 Oki MC361 Color MFP is a laserlike, LED-based product that prints impeccably sharp (though somewhat shiny) text, at a good clip. Where it falls short is in graphics quality, which is grainy and oversaturated, and in setup, which is less automated and documented than it could be. Toner costs are mediocre. If you have a bit more to spend, consider the $600 Canon ImageClass MF8380Cdw color laser MFP. Its higher price buys you a 250-sheet main paper tray, a 50-sheet multipurpose tray (for envelopes and other odd sizes and thicknesses), and a 50-sheet automatic document feeder, plus a 150-sheet output tray. It can print and scan both sides of the paper automatically. Connectivity includes USB, ethernet, and Wi-Fi. The toner costs are about average. The MF8380Cdw is slow for a workgroup laser MFP, but its output was good. Text looked extremely sharp, and monochrome graphics were truly black-and-white, with no color cast. Photos were slightly grainy, but had a warm palette (flesh tones looked orangey). If a sub-$500 color laser MFP is what you want, consider (with caveats) the LED-based Dell 1355cnw Color MFP (find.pcworld.com/71552). It costs just $420 and offers full multifunction capabilities, plus Wi-Fi. It also yielded some of the best photo quality we’ve seen from any color laser or LED printer. The 1355cnw is slow, however, and its consumables costs are high. Its lower-yield (700-page) toner replacements are extremely expensive, but at least its higher-yield ones (rated at 2000 pages for black, 1400 pages for each color) come tolerably priced. 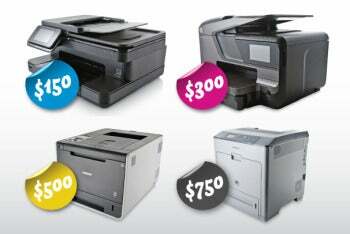 Any workgroup of small to medium size can get a good monochrome or color laser/LED printer for around $750. But keep an eye on the toner costs. The versatile, $750 Sam­sung CLP-775ND Color Laser Printer is our top pick. It breaks no new ground in output quality—photos are a challenge for it, as they are for most color lasers—but it’s fast and well equipped, and its toner is economical.